It is no small task to count the nearly 326 million people who live in the United States and its territories. Matching each person to one of about 126 million households is nearly impossible, particularly when it comes to counting people who rent homes, college students, recent immigrants, and people who are fearful of federal officials. The 2010 Census failed to count an estimated 1.5 million people of color and overcounted white people. The census is tested before the official count is carried out in order to figure out how to collect accurate responses from as many people as possible. For example, new questions that are added to the census will be tested in different formats to see how they affect responses, and the test provides the Census Bureau with an opportunity to train census takers in advance of the true count. If a test is not carried out effectively, it will inevitably affect the Census Bureau’s capacity to count people during the full census. The only “end-to-end test,” or complete practice run, for the 2020 Census is currently underway in Providence County. For the first time, people can respond to the census online, so the dress rehearsal in Providence is especially important for the Bureau to make sure the new technology is accessible and doesn’t create barriers for respondents. Testing preceding the full 2020 Census is less comprehensive than it was in previous decades, due to budget constraints that Congress has been placing on the Census Bureau for several years. In 2014, Congress decided that the budget for the 2020 census could be no larger than the budget for the 2010 census, without an adjustment for inflation. The full test was originally arranged to take place in three different counties across the country, including a test of a Spanish language census and tests in remote and rural areas, but due to the tight budget, Providence County was selected as the only test site. “When you look at Providence, it really is a microcosm of the nation,” Jeff Behler, the regional representative from the Census Bureau, told the Independent in an interview. Behler, who is overseeing the 2018 test, explained that the racial and economic diversity in Providence County reflects national trends and that the high number of renters and college students in Providence County will be good practice for census takers. Census test forms were sent to Providence County households this March, and in May, federal officials will be visiting households that have not yet filled out the forms. Community leaders in Rhode Island have expressed concerns that the census test is underfunded and that the Census Bureau has not reached out to community partners in Providence to raise awareness about the test. As minority and immigrant populations have historically been undercounted in past censuses, 2020 threatens to further strip already marginalized groups of their share of the $675 billion of federal funds allocated based on census population data. Even more directly, an undercount would dilute the electoral representation of these groups. This is no accident: critics have asserted that the federal government is intentionally suppressing census efforts to reduce political representation and affect how voting districts are drawn in the upcoming decade, thus protecting the Republican hold on federal and state political power. Undercounting minorities in the census would add to the efforts made by officials within the Republican Party in the past few decades to undermine the voting rights of certain groups through practices such as gerrymandering districts and passing restrictive voter registration and identification laws. The census directly informs the state-level redistricting that will take place in 2020. In Rhode Island, the prospect of an undercount is perhaps more alarming than in any other state. In December 2017, president of Election Data Services, Kimball Brace, conducted an analysis of Census Bureau data which showed that Rhode Island was 157 people away from losing a seat in the House of Representatives (and therefore an electoral college vote). For scale, Rhode Island was 52,481 people away from losing a seat after the 2010 census. Many people aren’t aware that the census test is occurring and are understandably surprised to receive inquiring mail from the federal government. Before the 2010 Census, a $133 million, four-month advertising campaign, produced in 28 languages, reached the average US resident 42 times with a message about participating in the census. More than half of the advertising budget was allocated for media targeted at minorities and immigrants. The lack of any funds for a media campaign or for partnerships with local organizations for the census test has been interpreted by Rhode Island leaders such as Mayor Diossa as a deliberate effort on the part of the federal government to neglect these populations in the count. Counting people has never been a neutral activity in the United States. To count a person in a representative democracy is to assert: the government sees you, you should be represented politically, and you should receive a share of the federal government’s financial resources. From its inception, the US Constitution conducted the decennial census count in terms that make an explicit statement about who its authors considered to be American. The Constitution mandated that the number of people in a state was determined by the “whole Number of Persons… excluding Indians not taxed,” and “three fifths of all other Persons.” That is to say, free people counted, Native people did not, and enslaved people were counted as three-fifths of a person. 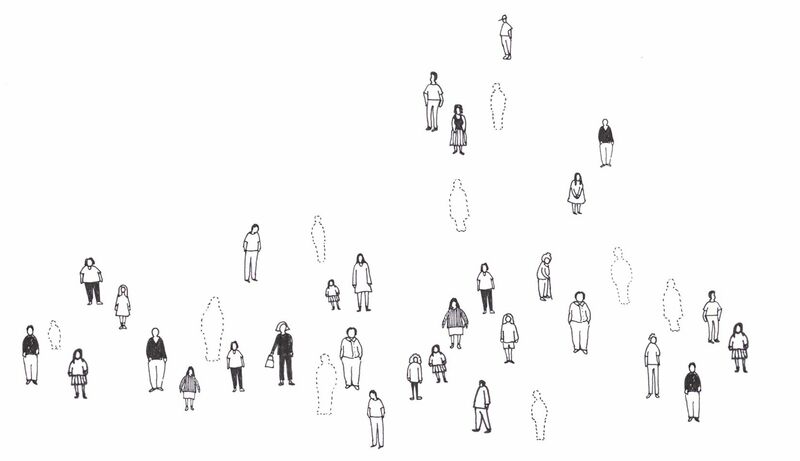 The census—the foundation for creating a representative democracy—was born out of exclusion. Although public officials and major news outlets have chastised the current administration for using the census as a means to prevent people of color, immigrants, and other marginalized groups from “counting,” this is by no means the first time a census has done this. In the centuries following the first census in 1790, the US has continued to use the poll as a political, and often discriminatory, tool. In 1924, the Congress used results from the 1910 Census, which included a question about citizenship, to justify the 1924 Emergency Quota Acts which restricted “undesirable” immigration from certain regions, writes Shom Mazumder, a PhD candidate at Harvard, in a recent article for the Washington Post. And during World War II, the Census Bureau shared data with the Secret Service about the number of people of Japanese descent living in certain areas, which was then used to place Japanese Americans in internment camps. Thus, the federal government officials that claim a proposed “citizenship question” on the 2020 Census is a benign way to collect more information about the population should be met with great skepticism. Secretary of Commerce Wilbur Ross announced last week that the 2020 Census would include a question about citizenship status for the first time since 1950, a move which experts from within the Census Bureau, government officials across the country, civil rights leaders, and others have said will lead to further undercounting of undocumented people, immigrants, and minorities. “Even before the citizenship question was entered, every single person [at this meeting] has heard from folks that are scared to be here ... the citizenship question addition to the census will create an undercount. It will cause the census to fail,” Gabriela Domenzain, director of the Latino Policy Institute at Roger Williams University, told a room full of people at a press conference about the Census in Central Falls on April 2. Domenzain explains that immigrants and minorities in Rhode Island and across the country fear federal officials for very valid reasons. The Republican Party in particular stands to gain from undercounting these groups, as the counties that will lose representation from a citizenship question tend to send Democrats to Congress and vote for Democratic presidents. The census has always been political, and the events of the past few months have revealed that 2020 will be no different. The underfunding of the census test in Providence County and the failure of the Census Bureau to connect with local partners to ensure a full count of minorities and immigrants, in addition to the recent news that the 2020 Census will include a citizenship question, have revealed that the current administration and Congress intend to use the census as a means of holding onto political power. The test already underway in Providence County reveals that the 2020 Census is going to require a massive mobilization by state and local governments and community organizations to achieve a full count. The Census Bureau faces a difficult task in attempting to count everyone, amid budgetary restraints and an executive branch which has revealed its intent to suppress the count of minorities, immigrants, and undocumented people. The stakes are high in Rhode Island, where the slightest undercount might mean the loss of an electoral vote and a US Representative—a prospect that Rhode Island has not faced since the ratification of the United States Constitution. JULIA ROCK B’19 thinks every Rhode Islander counts.